Ali'i Beach Rentals is a licensed full service property management company that specializes in vacation rentals in the Waikiki area. EVERYTHING Waikiki has so offer is a short stroll down the street! My wife and I have had the pleasure of occupying this unit for 50-day periods during the past three years, i.e. : from approximately 20th of December to the 8th or 9th of February, depending on the year. Rates were reasonable for long-term rentals but they now have doubled due to the implementation of a new rental policy. This policy causes this unit to be priced at an astronomical $19,000 US+ for a 50-day stay. Given those rates, it is strictly of interest to short-term renters. Short-termers should ask for a discount because the unit's beautifully-appointed kitchen becomes moot as restaurants would better cater to your dietary needs for a 1 to 2 week stay. We are grateful foe all of our repeat guests, and we could not get here without them! That being said, we were able to offer longterm discounts when the industry allowed for it, but we would be doing our owners a dis-service to keep doing so. Finding the balance for our guests and owners is the name of the game, and what we do best!! This unit is in the perfect location! Easy walk to the public Hilton lagoon and the beach off Ala Moana. You can catch the Pink trolley in front of the Hilton for $2 per ride to central Waikiki. Parking is easy with friendly attendants (it's gone up to $23/day). Our only complaints are the lack of basics (pots and pans are mostly bent up and unusable, missing most measuring cups, toilet paper was harsh and we feel we shouldn't have to buy trash bags and toilet paper if we are staying for 10 nights). Also no basics in the kitchen besides salt and pepper. We have stayed in many condo/home/apartment rentals and have always had more. There are also a few minor issues (ice maker doesn't work, bar stool is broken and dangerous). The mattress is perfect...we slept like babies! Also, i tried contacting the office to add a pre-night but the phone number says to call back and there was no response to the emil I sent. Overall, we love the apartment, but feel it lacks the added touches good management normally provides. With our new cleaning company we want to add a more personal touch, we are excited for this for sure! We are adding new carpet in December and a new fridge thanks to this feedback! The maintenance issues have been entered and will be addressed by our staff. We are not sure where the missed communication was, but we think we solved the internal issue because you let us know this, and we are very sorry. We had a nice time, and generally happy with our accommodations. The condo location was close to shopping, beaches, and parks. The condo was clean, except for a number of stains in the carpeting, and some signs of wear on the furniture. The bed was very comfortable and the kitchen was well equipped. Thanks for the opportunity to take care of you. This review, when presented to the owner, was the push we needed to get new carpet in December, so thank you very much! We hope to have you back soon and be sure to sign up for our Ali'i Beach Rentals Rewards program for points toward your future stays. ALOHA! 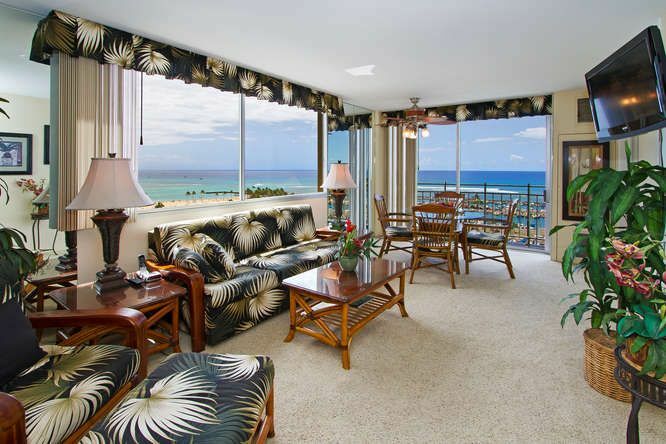 This condo at the Ilikai Marina Ocean was fantastic and a perfect place to start our Honeymoon vacation in Hawaii. You would be hard pressed to find a better view for the price and proximity to Waikiki, and if you want a front row seat to the Friday Night Fireworks at the Hilton, there are even fewer options. I got some of the most amazing fireworks pictures I've ever gotten from the lanai at this condo! The place looks even better than it does in the pictures. The AC was fantastic, and works even better if you close off the bathroom from the bedroom. The kitchen was well stocked, though it could have had things like salt and pepper and a few other basic condiments as we found at other places. The bed was very comfortable and I slept better than I do at home. There are two restaurants in the building, the Harbor Pub and the Chart House, and Katsumidori is a great sushi place half a block away. You are very close to the Alamoana Shopping center and very close to Waikiki Beach if you want to swim and/or lay on the beach or rent various beach toys. If you want to surf it is better a bit further down the beach. But Fort DeRussy Park has a huge relatively unpopulated section of Waikiki a short walk from this place. Parking was $24 or $29 dollars a day at the Ilikai Marina Ocean and you can pre pay and get a pass so you can just come and go. It is also very easy to get to as you are at the start of Waikiki. We spent 4 nights of our 6 on Oahu here and we wish we had spent all 6.